This is an amazingly perfect dish for a summer night.. Heat a non-stick frying pan on medium high for several minutes before salt and peppering a couple of salmon filets and setting them in skin side up for approximately five minutes. Then flip and cook for another five. Meanwhile, combine in a small bowl the juice of half an orange, a splash of rice wine or white vinegar, some extra virgin olive oil and salt and pepper to taste. Chili flakes are optional but recommended. 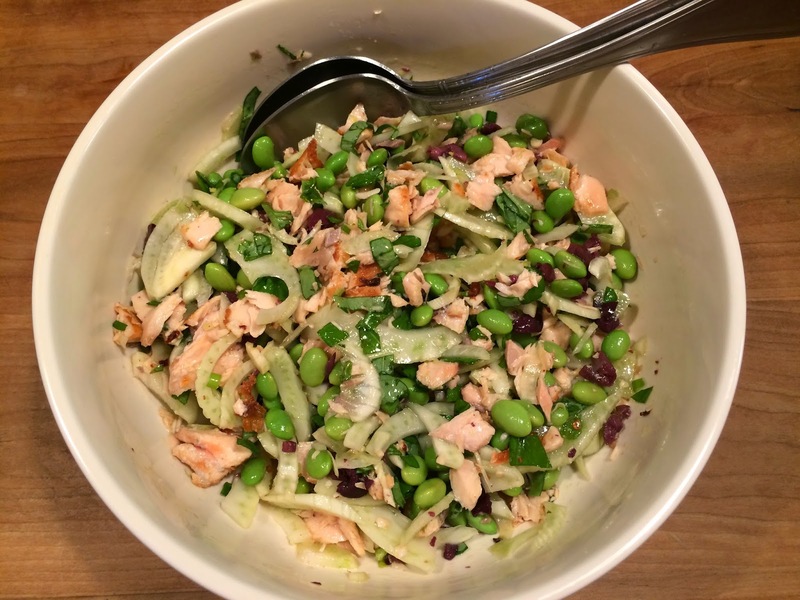 Then in a large bowl add a thinly sliced fennel bulb, a bag of shelled edamame, a dozen chopped Kalamata olives, a scallion, and a generous handful of either basil or mint. By this time your salmon should be cooked through. With a spatula place the filets on a side plate being careful to leave the salmon skins in the hot pan. Having removed the filets flip the skins and cook for another minute, they should be crispy but not burnt. To serve break up your salmon and along with the dressing add and toss with the other ingredients, then sprinkle your finely chopped crispy salmon skin over the top. Japanese Bacos…trust me, this is a good one.